As promised, we continue with our series PhD Insight. 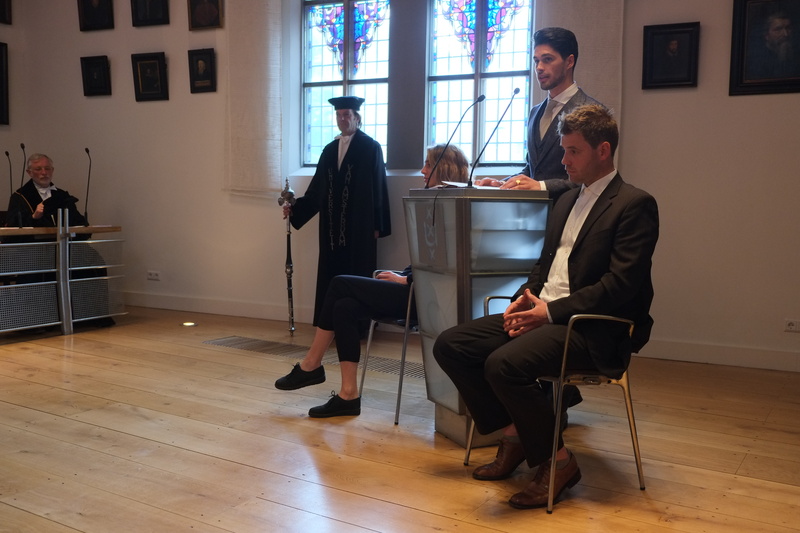 We already presented you dr. Jelle Boumans – one of the two people who successfully defended their dissertation in May this year. Now it is time to talk with dr. Toni van der Meer whose research topic was “Communication in Times of Crisis. The Interplay between the Organization, News Media, and the Public”. What was your educational background before you decided to start with a PhD study? I did a research master and a shortened bachelor at the University of Amsterdam and before that I did an HBO which is applied science education in sport management and marketing. During my HBO I mainly found out that I don’t want to work in sport management and marketing and therefore I wanted to study a bit more before going to the labor market. I found Communication Science and I thought that it was interesting combination between psychology and sociological research. At certain point I realized that I am enjoying reading about all the theories a lot. They basically show how knowledge was produced rather than just stating “This is how it is”. This more critical perspective was fascinating for me and my performance was pretty good so I was asked to do the Research Master. What is the difference between the research master and the regular master? Besides the research? (laughs) The research master is more challenging and a bit broader. It combines theoretical courses with a thorough training in conducting research. What is interesting is that you can make your own program from all the theoretical course offered in the different master tracks. In the regular master you get the academic perspective but in the research master it is taken a step further and the topics are discussed more in depth. Also, you have the opportunity to do a research internship. It was helpful for me in order to see how research is done outside of the university. What was also really positive for me is that you establish a closer connection with some of the best researchers that teach in the research master. The classes are smaller and there are also students from other departments and disciplines who you can learn from as they have other and interesting perspectives. You are also teaching at UvA. What is the most challenging part of being a lecturer? And what is the most rewarding? One of the most rewarding things is that sometimes you are challenged to think in a different way because of the new perspectives you encounter. The fact that the students have diverse background and are coming from various countries means that they come up with interesting and unexpected ideas. A challenge for me was the fact that I did not have a formal teacher’s education. You really need to understand what type of teacher you are going to be – do I want to be really strict or easy-going, for example, and this is something that you learn gradually in practice. I have only started teaching in January this year so I still have a lot to learn but I really like it. It is rewarding to see that the students are gaining knowledge and are getting more involved in the topic you taught them. Then you see how they go out of their way to find relevant information in the news about the topics you are discussing in class. Why did you decide to do a PhD? I have done an internship at a media company during the research master because I wanted to compare the academic environment and the business practice. What I found out was that you are more limited in the business practice in terms of doing basic statistics and researching mainly what the clients want. Basically, there was less freedom in terms of creativity as compared to academic life. But I wanted to continue doing research. At the same time I was really doubting whether I want to do PhD based on one topic I might be not that interested in. And then an option at UvA came along to write your own research proposal which is quite unusual. Normally, you just apply for a position where the general research question is already chosen, but ASCoR received a grant and organized a competition among the students. There were around 80 applicants and Jelle and I were among the ones that got this opportunity to start a PhD based on our personally written proposal. This is why I made the decision to do a PhD – it is such a unique chance, why not take advantage of it? How much time does it take to write a dissertation from start to finish? The deadline is three years. ASCoR selects mainly research master students so they do not spend much time learning the basics of doing research and they can immediately start with their dissertation. Normally, you write three to four chapters of your dissertation but you also have to do some teaching. You also do a PhD club where you meet other PhD students and you evaluate and criticize each other’s papers. Additionally, there are some courses you need to take like academic writing or introduction to PhD. So during these three years you are not just writing your dissertation but you are also working on your self-development. What is your dissertation about? After doing the Strategic Communication of Organizations course I found that the focus on crisis communication was sender oriented, e.g. what actions organisations undertake to repair their image and control the reputational damage. There was not enough attention to the relationship between the involved stakeholders. So I saw this as a gap in the literature. I wanted to see how communication flows between the organization, the media and the public. In my first study I looked at a couple of crises and how communication amid these actors aligns over time and each of the other three chapters was written correspondingly through their perspective. For the second chapter I examined how organizations relate to the different stakeholders during times of crises. The third chapter discussed how journalists select sources when they report about crises. For the final chapter I researched how the public uses information and sources when they encounter a crisis. Were there any challenges during the preparation of your dissertation? Having only three years to finish your PhD is a challenge in its own right. For the second and third part of my study I interviewed PR professionals and journalists and that took a lot of time because it is not easy to convince them to participate in such a project. Then you have to come up with a research design that actually works. I think I spent half a year to complete the survey among PR professionals and to make a thorough job of it. And if you do not find anything useful to report than you basically threw away half a year. The responsibility you have is also huge. Of course, you have supervisors but at the end it is your project. It was challenging to test the whole design but it was also without doubt exciting. At the end it worked out pretty nicely. What is funny, is that one of my first studies I did after my PhD, I did not find anything significant. And I thought “I am so happy that did not happen during my PhD”. What is the most interesting finding from the research according to you? What was really cool was that I manage to find comparable results in all studies. For example, you see that communication dynamics evolve during the crisis. In the beginning the three different actors stay away from each other and take their time to process and evaluate the situation based on their own personal expectations. Later on they are obligated to come together and to mutually make sense of the situation in order to make sure that the crisis does not escalate. That was confirmed in each study I did and the final results were tied really well. That helps in writing the dissertation because when you write the introduction and the conclusion you need to combine all the three or four chapters. If you have a lot of contradicting findings then it is hard to justify them all. What is the most satisfying part of doing a PhD? First of all, I have been to Puerto Rico, Seattle, Lisbon, Japan (laughs). Of course, that is not the most important thing but it is a nice perk. One of the main advantages is that you can really develop yourself when you do either research master or PhD and not only within academia. I think that you acquire skills that are useful for all types of professions like critical thinking and how to solve problems. Especially within ASCoR you have so many opportunities because a lot of great people are working there with connections all over the world and you can learn so much from them. There are a lot of courses you can take to expand your knowledge. If you are really interested in research it is so cool to examine in detail one specific topic, you have these three years and you can really become an expert on that. The fact that there are also so many other researchers that you can communicate with helps you to gain knowledge on other topics as well. You get this broad overview of state-of-the-art research which is helpful not only in the academic environment but also in the professional sphere. Pick any day of the week and you will find breaking news or top headlines on crisis situations in organisations, such as product recalls, bankruptcies or explosions at chemical plants. In his research, Toni van der Meer explores the communicative interplay among key actors in times of crisis. He focuses specifically on the way communications by the organisation in question, the news media and the public evolve during the course of an organisational crisis. His study examines several aspects – how the crisis frames of the three actors align over time; how stakeholder-organization relationships are affected by the crisis; how news media and journalists determine who gets a voice in the news during crisis; the selection of news sources by the public during crisis and the consequences of selection for public framing. You can read online dr. Van der Meer’s PhD dissertation. By the time Toni started his research master’s thesis he already knew that he will do a PhD afterwards so he decided to start working on the topic he will explore during his dissertation but on a smaller scale. His thesis dealt with crisis communication and frame alignment and later became the base on which Toni developed his PhD dissertation by examining more in depth the main concepts. So far he has been recognized for his research work and has won several awards like the Unilever Research Prize for his master thesis (2013), Best Student Paper Award at Etmaal van de Communicatiewetenschap (2014), Best student paper award together with Anne Kroon at the International Communication Association, Japan (2016). One of his most recent published articles from his dissertation are “Public frame building: The role of source usage in times of crisis” and “Disrupting gatekeeping practices: Journalists’ source selection in times of crisis” and the access to the later is free of charge for the time being. You can find more information about the PhD program on the ASCoR site.